57% of registered voters disapprove of Trump’s job performance; 40% approve. 46% of voters described the ongoing shutdown as a crisis, up 7 points from last week. 49% of voters mostly blame the president for the shutdown; 35% blame Democrats in Congress. As the partial government shutdown entered its second month Monday, the share of voters disapproving of President Donald Trump’s job performance reached its highest point of his first two years in office. According to the latest Morning Consult/Politico poll, conducted Jan. 18-22, 57 percent of registered voters disapprove of Trump’s job performance — more than any other survey in Trump’s two years in office — while 40 percent approve. The 17-percentage-point deficit matches two previous lows of the Trump presidency: in the first weekend of the shutdown, which began on Dec. 22, and in the wake of his comments regarding the fatal riots in Charlottesville, Va., in August 2017. Trump’s net approval – the difference in the share of those who approve and disapprove – has not gone up since the midterms, when Democrats won the House and strengthened their hand against the president for the second half of his term. That shift in power has coincided with a government funding standoff over Trump’s demand for a wall along the U.S.-Mexico border, leaving 800,000 federal employees without paychecks for more than a month. Trump has carried the bulk of the blame for the shutdown in every Morning Consult poll, with 49 percent of voters saying he is responsible in the latest survey – up 6 points since the shutdown began. In the same time, the share of voters who blame Democrats in Congress has risen 4 points, to 35 percent, while 4 percent of voters blame congressional Republicans, down 3 points. When it comes to his plans for the border, nearly half of voters (49 percent) oppose construction of a wall along the U.S.-Mexico border, up 2 points (the polls’ margins of error) since a Jan. 4-6 Morning Consult/Politico poll. Forty-three percent of voters support construction of the wall, the same share of voters as the poll conducted earlier this month. Both supporters and opponents of building the wall are dug into their positions, with majorities of both sides opposing compromise measures tested in the poll. Fifty-one percent of wall supporters would oppose a deal to reopen the government if it dedicated funds for border security, but didn’t fund the border wall. An even greater share of the wall’s opponents – 72 percent – would oppose a deal that included funding for a border wall. Congress is dug in, too. The Democrat-led House has voted several times on various proposals to reopen the government, and is planning to pass legislation this week that will include some border security priorities supported by both parties. But the Senate has not taken up those measures, which don’t have Trump’s support. The Senate is instead planning to vote Thursday on two dueling proposals to reopen the government. The first, backed by Trump, includes wall funding, temporary deportation protections for young immigrants in the Deferred Action for Childhood Arrivals Program and an overhaul of the asylum process for Central American minors. The second plan, preferred by Democrats, would simply reopen the government through Feb. 8. It’s not clear that either proposal has the necessary 60 votes to advance. 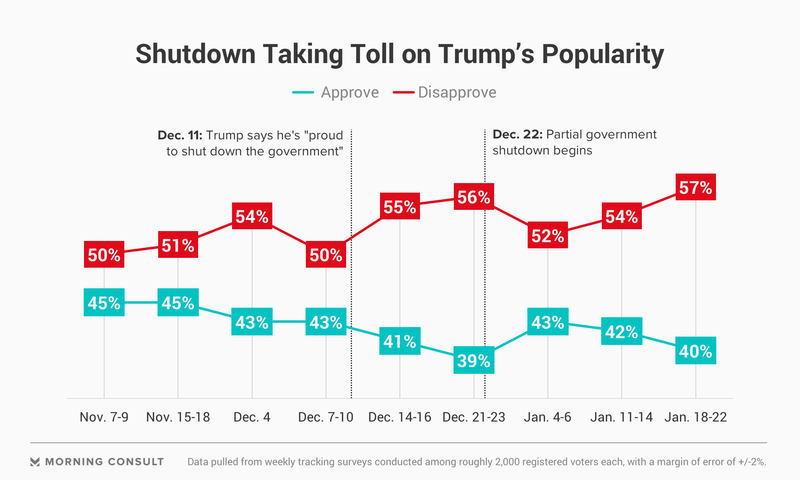 Most voters aren’t personally feeling the pinch of the shutdown, with 54 percent saying they or their family had not been impacted much or at all by the standoff. But that doesn’t mean they’re indifferent either. Fifty-one percent of respondents in the survey said they’re very concerned about the shutdown, including 46 percent of independents and a third of Republicans. And the level of concern is actually rising: Forty-six percent of respondents called the shutdown a crisis, up 7 points from last week’s survey. An earlier version of the crosstabs linked in this article incorrectly summarized demographic information regarding respondents with a favorable or unfavorable view of Trump. No results from the poll were affected.